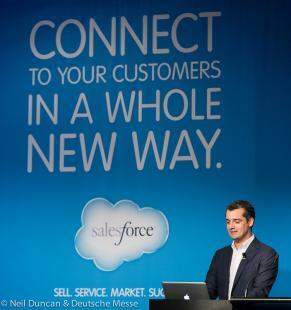 This morning, Salesforce announced it will acquire marketing software powerhouse ExactTarget for $2.5 Billion. For both companies, today will be day of excitement, filled with popped champagne corks, flocks of press and congratulatory pats on the back. Tomorrow however, the real work begins as the companies begin merging assets, services and the more than 11,000 employees employed by both businesses. Acquisitions can be an exciting time for employees, but also wrought with questions and anxiety. How will the company change? How will my job change? Will I still have a job? Unaddressed, these questions can lead to low morale, hostile relationships between staff and reduced productivity. Denying the inevitable will only lead to more frustration and hostility down the road. From day one, acknowledge change and that it will be slow process. According to WashingtonTechnology.com, “Acquired companies with a strong brand may need up to 18 months to complete the process.” Recognize there will be a lot of ambiguity in the beginning, but it is imporant to take each day-by-day. Focus on short term goals to keep employees motivated and focused. Often with an acquisition, decisions are primarily made from the top down. Such a system can cause feelings of animosity among employees, particularly from the purchased company, who feel they have no say in the process. Instead of directives trickling down, encourage employees to share their ideas on how to collaborate with the new company. What culture or procedures do they want to share? What employee-driven events or initiatives could help ease the transition? These days, most employees join a company because they are passionate about the work and the business, not just for a paycheck. As a result, companies will often develop strong cultures that attract new employees and increase retention. Unfortunately after an acquisition, this strong culture can clash with that of the merged company, creating an atmosphere of competitiveness and an “us versus them” mentality. To combat this culture clash, provide plenty of opportunities to share each other’s cultures and traditions. Host department or even company wide potlucks, as well as participate in each other’s rituals around birthdays, big sales, etc. Additionally, use this time to polish and hone procedures. Combine the best approaches to human resources, training, file storage from each company to create a system that works for everyone. After an acquisition, it should be expected all levels of leadership will be available for conversations with staff, not just the direct managers. This sends the message both companies are working to be as transparent as possible with employees. Additionally, managers should have personal conversations with employees about how the changes will affect their jobs, as opposed to only large and impersonal department meetings. If you are considering a merger or acquisition, it is important to involve staff early in the decision. In addition to these tips, there are several courses available from 360Training to walk you through the legal procedures for communicating a potential merger to employees, as well as performing due diligence to ensure the acquisition process runs smoothly.